Golf courses, rodent poison and dogs may not be a good combination, as some Valley Club homeowners found out late last month when their dog nearly died from poison that was most likely left for voles, small mouse-like creatures often referred to as field mice. Voles are known to extensively damage lawns, particularly in the winter when they make runways between snow and the ground. They also damage shrubbery and trees by gnawing at the roots. The dog in question was taken to the Sun Valley Animal Center the evening of Dec. 28 and treated by veterinarian Scott Acker, who confirmed Monday that the dog had ingested anti-coagulant rodent poison, although Acker could not identify where the poison came from. Acker said the dog is the only animal that has recently been brought into the center from the Valley Club area but that he treated two other dogs that had ingested rodent poison last summer. 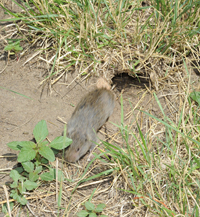 Blaine County Sheriff Gene Ramsey, who investigated the poisoning incident, said the bars are placed in small, hard plastic bottles with a hole cut only large enough for a vole or mouse to get inside to eat the poison. According to a data sheet on the poison, a 40-pound dog would have to eat at least 140 bars to get a lethal dose. A dog or other animal has to chew through the plastic to get to the poison bar. The poison and the method of administration are consistent with guidelines established by the Environmental Protection Agency, which is seeking to prevent use of rodent poisons that are not contained. Ramsey said the method of administration is in compliance with county code. Ramsey said it’s not known where the poison came from that recently nearly killed the dog. He said that in addition to the golf course, some Valley Club homeowners also use similar rodent poisons and methods of administration.